T-Mobile’s not laying down on hitting at AT&T’s early upgrade program even after T-Mobile’s CEO takes a series of shots on Twitter. 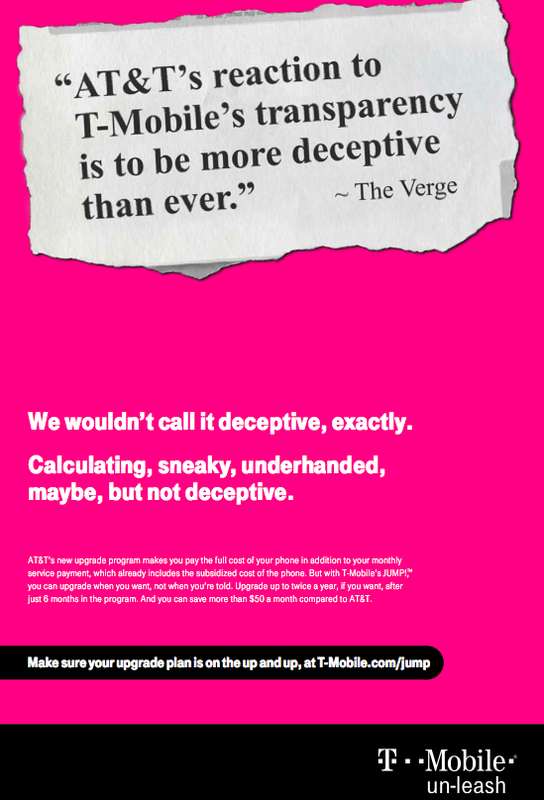 In a new ad that is set to run in USA Today tomorrow, T-Mobile takes a swing at AT&T’s “calculating, sneaky, underhanded but not deceptive” early upgrade program. I’d call it deceptive and I’d say that AT&T must have the best accountants to earth to try to spin their plan and make it seem as thought it benefits their customer base by paying both the subsidy price tucked into your rate plan and then a monthly installment. T-Mobile’s JUMP! program was launched back on July 10th and was met by mostly positive reviews from the press. The program itself allows customers pay a $10 upgrade fee to upgrade their phones up to twice a year by trading in their old phone model. 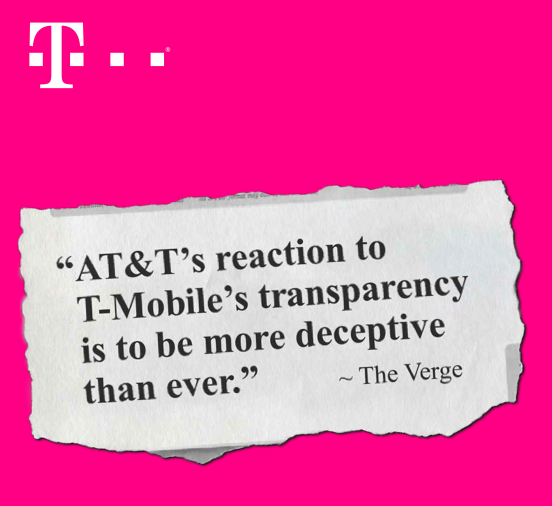 “There are real and material differences between what we are doing and the so-called upgrade programs that AT&T and Verizon are doing,” T-Mobile marketing chief Mike Sievert said in a telephone interview on Monday. While the jury is still out on just how good of a deal T-Mobile’s JUMP! program truly is, there seems to be unilateral consensus that T-Mobile’s program far and away the least worst of the 3. Expect to see more ads from T-Mobile taking aim at Verizon on Wednesday. ← White Moto X press shots leaked, specs to feature 2200mAh battery? I’m expecting to get downvoted here but “4 lines for $100” is also deceptive. I can picture a family walking into a t-mobile store wanting to switch and then they’re presented with EIP which will jack the price up to over $140/month at least. just saying, 4 lines for $100 is nice but, it is pretty deceptive. On the other hand, you become aware of the total price before you sign up, but still. You’re right. They should switch the wording, if anything, to four lines starting from $100/month. Then again, they’re trying to bring in people from MVNOs like straight talk and boost on that no credit check family plan and when they get throttled at 500mb they would get slowed down to speeds they are used to anyway. See above. :P Though you are more correct. OMG You actually get the customer base T-Mobile targets! Or you could spend 98% of your time inside wifi range and just use data when you’re out. Personally most times I’m out and about I have two hands busy on handlebars and no time to push on screens. You can’t get EIP with that plan. It’s prepaid. Yes, but T-Mobile isn’t advertising the postpaid option in the same way. It’s still not prepaid; just not on contract. TMO *also* has its prepaid plans. You’re not understanding me. The new plan family plan without credit check is prepaid. The new one that was just announced and i believe only available in-store. I’m not talking about the postpaid option. Both are the same prices, but they’re different plans. You’re not understanding me. The new plan family plan without credit check is prepaid. The new one that was just announced and i believe only available in-store. I’m not talking about the postpaid option. Both are the same price, but they’re different plans. The prepaid one also has a limit of 4 phone lines and MBB line. TechHog… that is incorrect. The no credit check plan IS a post paid plan… you put a deposit for your first month… but it is still a traditional plan with all the taxes and fees. The pre-paid does not give the discount for additional lines. Look at the article here about the plan. Specifically, the image in it. T-mobile separates the rate plan and the phone. Someone who has 4 lines at At&t can get their current phones unlocked an absolutely get 4 lines service for 100.00/mo and the same is true for anyone that brings their own device. so there is absolutely nothing deceptive about it…..and if a customer does decide to purchase a phone on EIP then the price is based on the phone they choose, and not “over 140.00/mo at least” as you stated. So the average 4-person family that is currently off-contract, wants new phones, and is checking out T-Mobile sees the 4 lines for $100 deal, goes into the store, and then realizes that it will be $140/month if they all get LG Optimus L9’s at $10/month each (cheapest “real” Android phone). If they want iPhones or GS4’s it will be $180/month. Go tell someone – “4 lines for $100, but it doesn’t include the phone,” and I don’t think they will quite understand. It’s deceptive to the average person….obviously not to us. I don’t think they understood it when the concept was first introduced but it takes time when you introduce something like this to an industry that was based on subsidizing equipment but its really pretty simple. ….you pay a fair rate for your SERVICE then choose what tier of device you want to buy……just like the cable/satellite company doesn’t provide a tv, you choose your programming and pick a $500 tv or a $3000 tv. The only reason cell phone customers expect a phone with the service is because that’s the way its been done forever and that is what T-Mobile is trying to change. You’re talking about the new no credit check plan, right? Stressing to people that No contract means unfortunately they can’t discount phones, but they will discount the service. So if your educated then you realize the important part is being discounted and you select your own device. Um. I think at this point you’re just nit-picking. The deal is 4 lines… not 4 phones… if your customers can’t read or tell the difference then thats on them. Who in their right mind would walk into ANY place and expect to get 4 new smart phones, and lines of service, for only $100….. And if you don’t want early upgrades, don’t get jump, simple as that… but it might actually be cheaper to get jump (which includes PHP) vs buying PHP alone depending on the phone. If they are advertising (and I haven’t seen this ad) 4 lines of service, with unlimited data (no overages) and the total comes out to be $100, then it isn’t deceptive. Whats deceptive is the consumer mindset that thinks you’re supposed to get ALL THE PREMIUM PERKS for only $100 – get real. If you pay full price for the phones, it is $100. You use one of many factors to make your point. Like you said, every one will know their price depending on their circumstances before they sign. I’m just wondering how many families would walk in and pay full price in order to get 4 lines for $100. It seems like the market they’re going for isn’t going to have the money to put $1000+ down on phones before they walk out the door. There are plenty of people who get used phones cheaper.. they can get this plan and still save a lot of money. I get what you’re saying though but this is still a good option. Do you not know what prepaid is? I am not criticizing the prepaid model. I like it. I like 4 lines for $100. BUT it’s a technicality and people hate technicalities. People who buy prepaid expect to buy phones outright. This is a prepaid plan. There’s no technicality. You’re just being the annoying troll you always are. People bring their own device all the time, and that customer that hates AT&T can get their phones unlocked for $40 max on the spot or free through the ATT website if still current. Also if your someone who doesnt have good credit and wants an iphone 5 then your being slightly unrealistic and tmobile should not activate you due to the part of the monthly bill would probably go unattended. I don’t think the EIP is available for the no credit check plans.. I may be wrong..
It’s not that what I was mentioning above when he mentioned deceptive when it’s not. Actually it is very deceptive, from a salesperson’s point of view. I Haaaaaaate when I talk about monthly service at 60-70.. Customers always say what happened to the fifty dollar plan… It’s like dude, that plan is 500mb of 4G/LTE DATA. If you’re buying i5 S4, and want 500mb of data you’re CRAZY. people are like ohhhhh it’s still unlimited though, yeah try that hot phone throttled to 2G, 100kiloBIT down and 20 KILOBITS upload. That four line family plan if they are high end phones should be at a minimum 140plus EIP AT 20 A PIECE. THAT 210. TRULY unlimited 180 plus 80. Verrry deceptive how fifty can turn into 100 really fast. Oh you want the fifty plan? Okay plus iPhone 5 add 21 plus jump and insurance add 10 plus your taxes that’s like almost 90 in new York. Sorry about spelling typing on the phone. Well as a salesperson you know that T-Mobile sells service and helps finance the phone. I personally tell my customer how much a phone is when they ask then offer to finance. 4 lines/$100 is a killer but advertising your lowest price makes sense and gets them in the door. The Simple Choice plan isn’t deceptive at all. They advertise their service at a specific price point. They never mention devices and insurance in that price point. If they didn’t offer EIPs would you still call it deceptive? They’re giving their customers an option. Not everyone can pay outright for the phone they want. And eliminating subsidies is great for us as customers. 100$ for unlimited talk, text, and 500mb of data with no overages is a great value compared to other companies. And what’s this 500MB is a joke on an S4/iPhone 5? I roll with 500MB a month on my HTC One and do just fine. And I heavily use this phone for browsing, internet heavy apps etc. I can live without video and music streaming easily when I’m on the go. Especially when I have 32GB of space to fit my media onto. Between that and app updates and downloads, play it smart, WiFi is everywhere. I gladly paid $400 for this 5 day old HTC One that I found on Craigslist. Hell of a lot better deal than an eip or subsidized plan anyway. I gladly paid $400 for this 5 day old HTC One that I found on Craigslist. It was a hell of a lot better deal than an eip or subsidized plan anyway. A 500MB data plan is not crazy for some people. What is crazy is that a salesperson thinks that he knows my data needs better than I do. Only if they don’t buy the phone outright does that $100 become $140+. Even at $140, thats a hell of a lot better than ATT/Verizon or even sprint with 4 people. Deceptive I agree, but I think it is because it is aimed at other wireless phone company customers. They can just bring their phone over and since it is paid off, have a much lower phone bill. Literally a 2GB plan on Verizon or ATT, not sure which one, is like 90 bucks, where on TMobile the comparable plan is 2.5GB for 60. That is a nice chunk of change for anyone. But I think Tmobile should have a special training/info packet or something to explain the EIP and the difference between seperating the phone costs and the service bill, where as ATT and Verizon bundle it together. I believe the 4 lines for 100.00 is not post paid its prepaid in advance and there is no option for eip for that reason so it’s not deceptive..
And besides what if u byod or pay full price as well as to what some people do. upgrade programs,in details,guess who came out the winner? Tmobile! John should use that,to hammer the other 2. I read that article earlier, I didn’t even know their 2GB family share plan was like 90 bucks, Vs a Tmobile Plan is 60 for 2.5GB and even if you add the EIP for like S4 it puts it at 80 bucks. att., or big red,ask them to do this too,and see what they tell you. LoL! I’m surprised that T-Mobile was #1 in Washington, DC for two reasons. One is objective: in DC proper, the EIP is unavailable. The second is subjective: I can count on one hand how many of my co-workers (suburban) are on T-Mobile. One switched to T-Mobile and during buyer’s remorse switched to AT&T due to T-Mobile coverage issues everywhere that he goes except work. I praise Tmobile for calling ATT out. It needs to be done but I don’t think this ad clear at all in HOW ATT is ripping people off. My thing with TMUS is that they are spending money fighting the wrong battle. Sell you strong point not the other’s short fall. TMUS has come a long way and now have LTE( even though some work still need to be done with coverage), but transparency is not gonna cut it. I want to know how the coverage, phone selections and cost of services are before thinking of transparency. At this pace TMUS they might still be loosing than gaining customers. I disagree. TMO has gone to significant lengths to devise a rational upgrade plan. In my opinion, AT&T’s and Verizon’s intentionally try and blur that line to defang “Jump” as a marketing tool. It’s important for TMO to show that their plan is different and how. That’s why Verizon and AT&T are really doing this. By copycatting with much worse but “similar” offers, they are trying to take away the advantage of T-Mobile’s unique business model. This pisses me off more than words can describe. Verizon and AT&T are there to keep their customer base or bring in new members and will not just sit still watch TMUS steal from them. Is what they are doing good? I think not . Is it legal ? Yes. TMUS can do a better job selling their new gig better than what they are doing now. What they should have is prepped better ads and hit the airwaves as soon as they announce the jump or whatever it’s called before the others come in their message would be in. But very few knew what jump was before the other two came out with copycats and that gets you mad? We did start releasing ads. Right away. It was less than a week later that the copycat plans came out. And yes, it makes me mad. just because it isn’t illegal doesn’t mean its on the up-and-up. I think calling this BS out is exactly what T-Mobile should do. It shouldn’t be the only ads, but they’re not, so that’s why I disagree with you. Trust me when I say I do want to see TMUS prosper but when they run ads that doesn’t give potential new customers reason to join them then don’t blame the game. You don’t see the other two running ads saying TMUS is this or that, they sell their strong points. And so should TMUS do. They should do better. AT&T and Verizon own the giant share of the wireless market and that happened before jump or any other thing TMUS has going now. They should have customers see why they are better not the other way around as that hasn’t and will not help them anyway. If you go to a job interview you put out what will make the guy hire you not what the other guy can’t do or doesn’t have. You’re missing the point, the JUMP program is part of the difference and advantage T-Mobile was trying to show. Its a value proposition. Now Verizon and AT&T are trying to be like “oh we do that too lol” … If you’ll notice, the big commercial pushes right now are for the JUMP program, we were TRYING to show how we’re better and they are trying to take that away from us. You’re saying we shouldn’t fight back against that? I think you’re better off not JUMP-ing to your next phone if you upgrade frequently. Sell what you have and buy at full price. They’re deducting the balance of the financing, which isn’t all that much. If I bought a Galaxy S4 today on Jump and in 6 months decide to dump it, they’re giving me $360 for the phone minus the $60 in JUMP fees it’s more like $300. Whereas if I decided to take it to Swappa, I’d get more like $500+ back out of it (there’s a GS4 there right now for $400 but no pictures and not a real IMEI based on staff comments – everything else is $540 on up). Now if you want insurance, JUMP is the only way to go – I just don’t think I’d actually go that route to upgrade. I’d pay for JUMP just to have insurance, pay off the phone and then upgrade like normal instead. The S4 was just recently released so of course they will command a higher price. I’m not saying you won’t get more than $360 through another avenue but in 6 months it’s highly unlikely you’ll get $500+ for it. Probably, but all I have to get out of it to break even is $300 since you have to have JUMP for $10/mo for 6mo. Except Jump replaces you insurance and on an S4 you actually save 2 bucks a month, which I know isn’t much but its not like you are adding 10 dollars a month. Your bill literally won’t change. EDIT: Matter of fact it is kind of silly not get into JUMP just in case. Because there is the scenario that, maybe you are having trouble finding a buyer or don’t feel like waiting? You don’t need to sell the phone to break even, because technically when you trade in your phone you are breaking even, by coming up with the remainder of what you owe. So if you owe 300, instead of going through the hassle of finding a buyer, good news you just found one. T-Mobile will willingly pay you for your phone, it just so happens to be exactly what you owe. And now you have 300 dollars in your pocket you didn’t have to spend to pay off the phone to upgrade, and you can spend that on the grey sticker price for your future phone. What happens is this LOOKS like you are getting taken for more money… but really there is nothing negative about it. Even having it saves 2 dollars on your S4. you forget to mention you still owe the remainder of the cost of the phone. This is not for everyone, however, they are giving exactly what people are asking for. So maybe you need to be careful what you ask for, cause you just might get it. Actually I did the opposite – if you re-read my comment I said I’d pay off the phone and then upgrade like normal, implying that after paying it off and upgrading I’m selling it elsewhere. You’ll be money ahead paying off the phone and selling elsewhere. T-mobile understands this and is okay with the more savvy consumer finding ways to sell their device and hedging that the marketplace isn’t saturated thus price is higher selling in the open market then the remaining EIP balance. The OP was referring to selling the phone versus upgrading through the JUMP! program. In that scenario the customer would have to pay off the EIP. The insurance part for me is the best part of Jump. Might get a phone I like and not feel the need to upgrade or there is nothing that really interests me offered through Tmobile after 6mos. But if the phone breaks or is lost, i could get a brand new phone instead of a refurbished model. That makes it worth it for me. Pre-JUMP insurance was cheaper, but I agree it’s worth having regardless. I’m not saying JUMP is a “bad” deal – it’s the best of whats’ out there for sure. But don’t think for a minute T-Mobile isn’t going to be making some money on this, probably in the form of used phone sales, and small cuts off of the JUMP money. The former will be bigger than the latter for sure. Isn’t there a small but still material deductible for insurance claims? I don’t think we should classify JUMP as ‘least worst’, it puts it in a bad light. It is simply the original and the best of them all. T-Mobile isn’t taking advantage of us like those other carriers in terms of plan pricing, and if we update religiously every 6 months we end up gaining the most. Hey David, not really that active on here but the link to the CNET article if you have not read it, but also so anyone else can read it too. Really great explanation numbers wise. It’s only a great deal if the customer wanted insurance in the first place. It wouldn’t be a great deal for a person like me who doesn’t insure phones and considers it a waste of money.